Playing open 7th chords on guitar is really quite simple – especially if you have already mastered playing major and minor open chords. And they can add a distinct flavor to your playing. Not to mention that a lot of songs you probably want to learn incorporate the use of 7th chords. A lot of people associate “dominant” 7th chords with blues and whilst they are used a lot in blues they are also used in a lot of other genres. Without getting too technical 7th chords essentially have some form of a 7th note of the scale in them. There a few different types of 7th chords but this post will be discussing “dominant” 7ths which are the most common form of 7th chords. If you aren’t sure about how to read the chord charts below then check out my basic open chords post at the link below. It explains how the chord charts work. And if you haven’t learnt the open major and minor chords then I encourage you to do that first before moving onto 7ths. Major chords use the 1st, 3rd and 5th notes of the scale, whilst minor chords use the 1st, flat 3rd and 5th notes of the scale. Dominant Sevenths use the 1st, 3rd 5th and the flat 7th notes of the scale. So they just bring 1 extra note -the flat 7th. 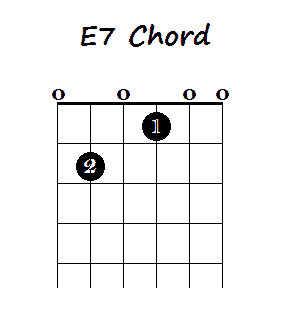 These chords are usually simply written with a “7” – e.g. E7 – often with the 7 written smaller. This is not to be confused with the major 7 which is written maj7 – e.g. Emaj7. 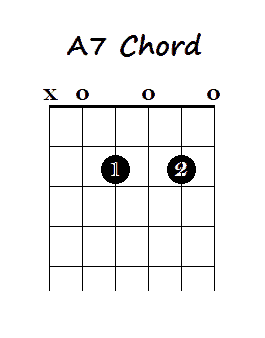 That is a different kind of chord that uses the major 7th instead of the flattened 7th. There are also minor seventh chords which bring in a flat 7th to a minor chord. So they use the 1st, flat 3rd, 5th and flat 7th notes of the scale. Don’t worry if this explanation is above your understanding at this point – this post will be solely dealing with dominant sevenths the most common 7th chords) – so you will just be adding a flat seventh note into the chords. And I will only be covering a handful of “open” major 7th chords. In another post I will cover making 7th chords from barre chords. And at a later date I will get into minor 7ths and some other variations. If you haven’t learnt any open major and minor chords or aren’t sure how to read the chord charts below check out the link below. 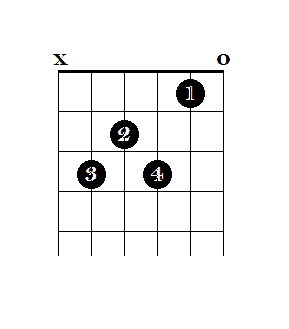 So there you have the 5 most common open 7th chords. 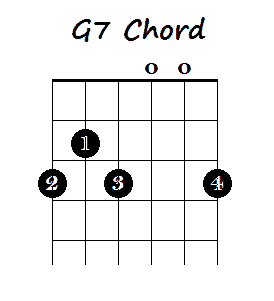 Remember that there are several types of 7th chords and that these are known as “dominant” 7ths and they are the most common of all 7th chords. Next week I will go over forming 7th chords using barre chords. I hope this post has helped you to discover 7th chords and that you can now use them to add color to your playing and expand your repertoire. If you have any questions or anything to add please leave a comment below. This is a great website you have here. Very informative. I have been looking into starting guitar lessons. I will be book matking this site and sharing it with my friends. Do you have any suggestions on a guitar for beginners? Should I start with an acustic guitar or an electric? I want to eventually get into learning the electric guitar but wasn’t sure I should start off with that. What do you suggest? Thank you for sharing. I don’t think you necessarily need to start out on an acoustic guitar. I started learning very briefly on a nylon string acoustic before moving to an electric. I mostly play acoustic these days but started out (apart from a couple of months) playing electric. One advantage of starting with an acoustic is that you don’t need an amp. You could start out with an electric without an amp but it may become boring after a while. If you do start out with an acoustic you don’t have to start with a Nylon string guitar (as some people suggest you should) – especially if you want to learn electric down the line then you should start out with a steel string. There are some other things to think about when going for a beginner guitar. You can check out more at the link below. Great article, it makes it really easy to understand how to play open 7th chords on guitar, last year I tried to teach myself how to play on the guitar and it was difficult. I love your site and it encourages me to go back and learn how to play again. Glad you found the article helpful and that it has encouraged you to get back into the guitar. Definitely having a structured learning process will make learning more enjoyable because you can make steady progress and also it is a much more effective and efficient way of learning. Whilst I hope that my lesson articles are helpful I don’t claim that I have a structured learning system on this site but I do review online lessons and you can check out some of my reviews at the link below. If you would prefer to learn online at your own pace (it’s kind of akin to being self-taught except that you have some guidance/mentorship) rather than traditional lessons then these are worth checking out for sure. Playing open 7th chords on guitar seems quite simple after reading your informative post. The visuals also made it really simple to understand. 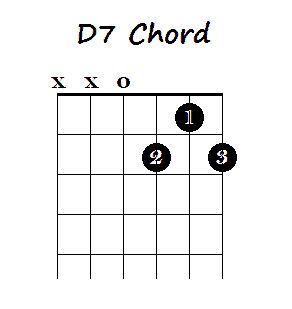 I am looking forward to your next post about forming 7th chords using barre chords.I enjoyed reading your post, thank you for providing us with this information. You’re welcome. 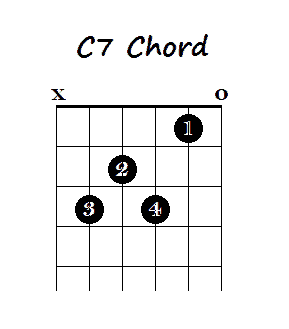 Yeah 7th chords are super easy when you get down to it. And can really add flavor to your sound. You can check out 7th barre chords at the link below.